To create the home like toilet experience, deluxe flushing toilet is one of its luxurious kinds available for rent with portapottydirect.com. 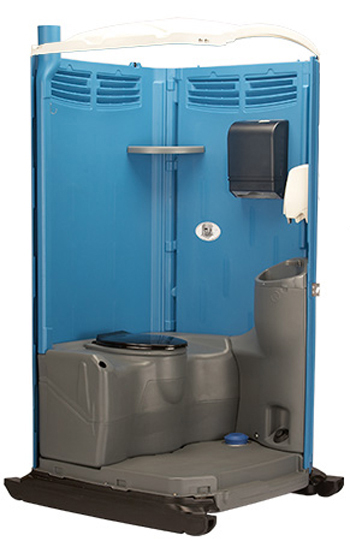 What distinguish the deluxe flushing toilet from the rest of the portable toilets are sophisticated toilet equipment and much comfortable space in the enclosure. The weight of the deluxe flushing toilet has been decreased so that it’s much portable now. It’s of standard measurement of 4’ wide x 4’ deep x 7.5’ high but made much lighter to port. The interiors are so flexible, modern and sophisticated in nature; they constitute a separate urinal commode apart from potty bin, fresh water reserve, all new foot-pump to release water in sink for hand wash purpose and of course, default toilet flush. All the additional features together help in bringing you the home – like restroom experience outdoors!